For my lovely friend Amy here is the link to the website www.re-foundobjects.com I was just talking about. Beautiful shop RE that I discovered recently. As I have mentioned I am getting married next year and am already busy planning 'the look' of it. Of course this is the most exciting bit when you are a creative type, but thinking creatively and cheaply has become the order of the day. We are getting married in a tiny church in our village and then having a marquee in the local pub garden about 50 metres down from the church. The pub garden backs on to our back garden so you can imagine how intimate and close this all is. I have never fully understood why weddings cost so much before but boy am I finding out now. We have chosen the most basic 'no frills' marquee mainly because of cost but I really don't like the whole frills and bows look anyway. 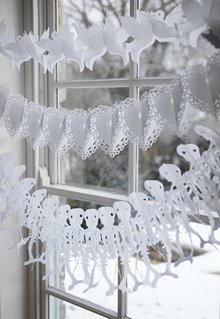 So have found some lovely paper decorations which I think in mass could create real impact. 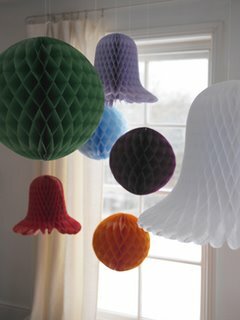 For starters these balls in large white and smaller light blue hung in groups could look really light, fresh and pretty. The whole colour scheme is white and Pale blue. Very scandinavian! 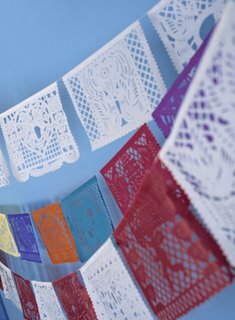 My boyfriend, whoops Fiance seems to break into a cold sweat when I mention the word bunting and has made his feelings clear that there is an absolute ban on any at all at our wedding. The B word is like a swear word and the small amount i did manage to sneak in last Summer got abolished to the bottom of the garden where it can be seen by absolutely noone. But I think I may have fooled him. These Mexican Paper picados are as I keep telling him Mexican Paper Picados and not at all like bunting. Ha! Well they are not are they?!? I love them and the top one is wedding themed. And I thought these paper skeletons would fit in nicely too. What do you think? No....? the doves and hearts might work instead then. 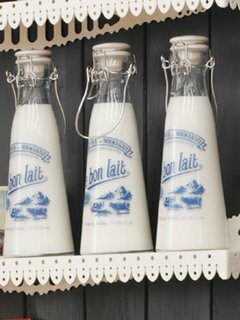 So have a look at their website because there are some really lovely things for the home including those French milk bottles that also seemed to jump into my shopping basket while I wasn't looking. Cheeky little things!!??!! Au revoir friends and happy shopping!!!! except it's something to accomplish with Girl gaga! Your own stuffs outstanding. At all times deal with it up!